Fall has returned and with it the multiple varieties of winter squash. Originating in the Western hemisphere, there is evidence of squash being consumed in Mexico more than 7,000 years ago. Unlike the summer variety, winter squash has inedible skin and tough flesh that needs to be cooked for a long time to be eaten. They are also larger and heavier and impossible to chuck at passing revelers on a fall hey ride with any accuracy. 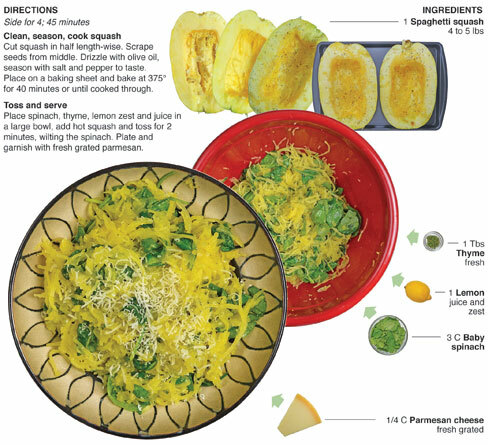 Generally, I am not a big fan of winter squash but one variety stands out: Spaghetti squash. I love to use it as a replacement for the obvious – spaghetti pasta. It has a nice mild flavor and is much lighter in the belly. For this recipe, I combine spaghetti squash with spinach and accent it with lemon and thyme. Residual heat from the squash right out of the oven is used to wilt and cook the spinach. The fresh lemon and thyme combined to give the dish a signature taste. It’s surprisingly light and flavorful and a great side for almost any meal. 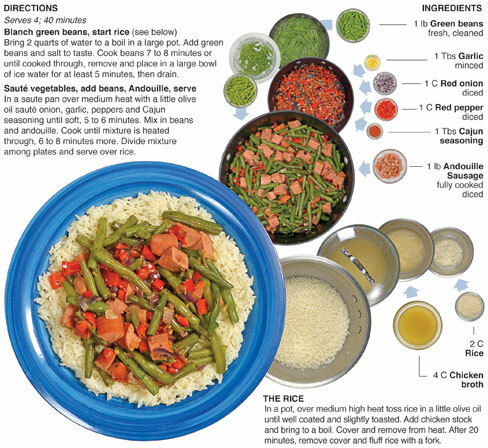 Years ago I made a recipe similar to this that I found in Cuisine at Home magazine. The original dish called for angel hair pasta and I thought spaghetti squash would be a great substitute. The squash actually enhanced the flavor. It’s much lighter and has a subtle garlic-like taste and compliments the flavors surrounding it. I was really pleased with the dish overall. It seems that I make a lot of heavy dishes, so it was nice to make something that would appeal to people who are dieting or more apt to eat lighter. 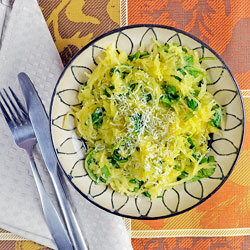 Spaghetti squash is a fantastic substitute for spaghetti pasta. This is the second dish I have created for Behind the Bites that I have done it and both were a success. The first time the swap was for spaghetti and meatballs, which feature a sauce and protein that are really the star of the show. In this dish the squash is much more prominent and it stood up well next to the lemon and thyme. Once again, I'm impressed with the spaghetti variety of squash. I'm really not a fan of winter squash in general. I think it’s bland and has to be cooked so long that it looses it's texture. Spaghetti squash is definitely the exception. I look forward to working with it again. Cut squash in half length-wise. Scrape seeds from middle. Drizzle with olive oil, season with salt and pepper to taste. Place on a baking sheet and bake at 375° for 40 minutes or until cooked through. 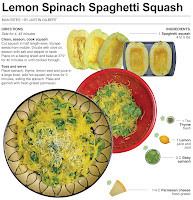 Place spinach, thyme, lemon zest and juice in a large bowl, add hot squash and toss for 2 minutes, wilting the spinach. Plate and garnish with fresh grated parmesan. When I told my Mom about making this pizza she rolled her eyes and gave me a smirk. I couldn’t help but agree. Green bean casserole on a pizza. 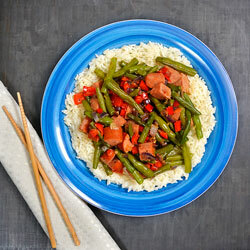 Sounds crazy, but it was an easy experiment and I had a bowl of cooked green beans left over. After documenting my Cajun Green Beans recipe I realized I had not taken a photograph of the green beans after they were blanched. I cooked another pound a couple days later to get the shot, which left me with a batch of beans. I knew I was going to have them which got my brain working. 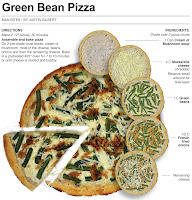 My favorite green bean dish is green bean casserole. I have made it several times (Once completely from scratch) and thought that I could do something inspired by the casserole. That’s when a pizza came to mind. I thought it was worth a try. 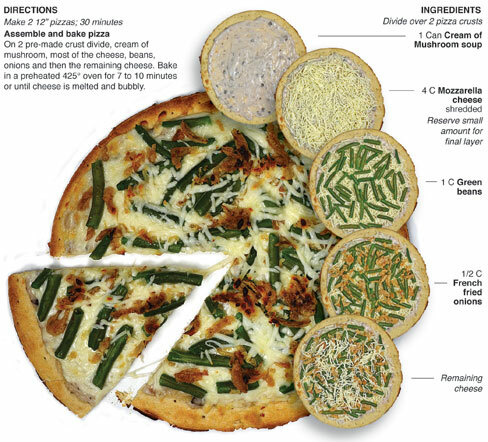 The end result was awesome – Pizza at it’s gourmet best! I left some for Mom and when I talked to her later she agreed. We were both totally surprised. 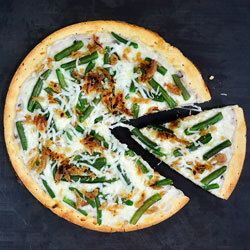 The onions and beans compliment each other and the mushroom soup mixes with the cheese for an incredible creaminess not found on your average pizza. Green bean casserole is something I look forward to every year around Thanksgiving. Four or five years ago I decided to make it completely from scratch - Fried onions and all - after watching Alton Brown do it on an episode of good eats. The entire recipe ended up being disaster. I started by burning the onions, because the recipe called for them to be crisped up in the oven rather than fried and I left them in to long. After that, the cream of mushroom soup never thickened properly which left me with a thin milky sauce coating the beans and burnt onions on top. It was a gallant effort that just never came together. I think that this year I might try to make it again from scratch, but I’ll do it with my own recipes. I’ve made cream of mushroom soup as well as french fried onion here at Behind the Bites. I may break them out and combined them into a classic turkey day treat. Green beans are nearing the end of their seasonal cycle in the Midwest. Since I can remember, most of the people in my family with gardens have a large portion dedicated to the little green pods – which means an almost never-ending supply for the entire family. I used to think the Jolly Green Giant was like the Tooth Fairy or Santa Claus, only he would sneak into our basement while we slept on Labor Day to stock the pantry with jars of canned green beans. With an abundance around, I like to cook them fresh before they go bad or get canned. My favorite way to cook green beans is to blanch then, which means to boil until cooked through, then plunge them into ice water to stop the cooking process. They can then be reheated with other ingredients in the final dish. 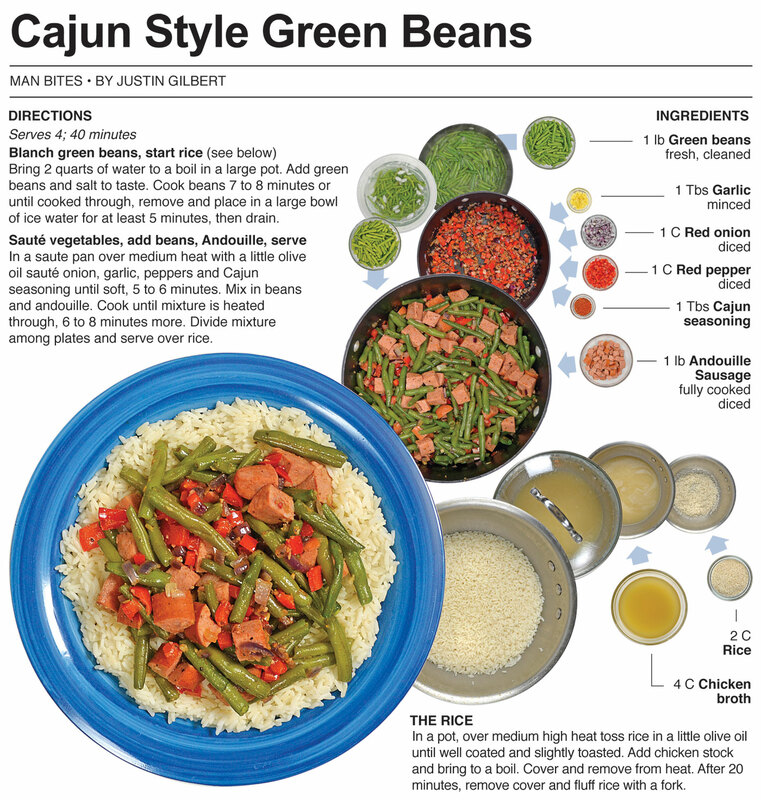 For this recipe, after blanching the beans they are added to a mix containing Cajun seasoning and a New Orleans staple – Andouille sausage. It is served over rice for what I call Cajun Style Green Beans. I have mentioned Big John Maxwell, the Ragin’ Cajun, in several posts over the last few months and recreated some of the dishes I have cooked with him while catering weddings at the Shiloh. This dish is my first “Cajun” recipe I have attempted using John’s knowledge of cooking. It is my own creation, just inspired by some of the tid-bits I have picked up working with the Ragin' Cajun. I basically create a stir fry with Cajun seasoning and andouille sausage. I use McCormick’s Gourmet Collection Cajun Seasoning in this dish and it does what good Cajun seasoning is supposed to do. John taught me that using a variety of different peppers like cayenne, black pepper and chilli pepper helps distribute the heat to different parts of the mouth. Individual peppers affect different areas. A great way to test this theory is to sample a jalapeno first and a habeñero second. I wouldn’t recommend eating them raw, but in sauces based with the peppers. You’ll find that the jalepeño hits right away in the front of the mouth while the habeñero take a few seconds and hits toward the back of mouth and throat. The habeñero will pack considerable more heat so beware. Good Cajun seasoning utilizes this concept and the McCormick seasoning does that well. The Johnsonville Andouille sausage I picked up at Meijer was disappointing. The overall recipe is really good - I will make it again for sure. I will use different andouille though, what I bought at Meijer was picked out of a meat case with hundreds of different sausages and it shows. It tasted more like a spicy smoky link, which is not bad, but I have had good andouille and I was expecting that. I’m disappointed but learned a great lesson when purchasing andouille in Fort Wayne: Go to a specialty meats retailer! Every so often it’s totally worth spending a little extra for great flavor. This dish isn’t quite the soft shelled crab from the menu of John’s food truck, but it’s a nice start in experimenting with the flavors of New Orleans and the Bayou. Bring 2 quarts of water to a boil in a large pot. Add green beans and salt to taste. Cook beans 7 to 8 minutes or until cooked through, remove and place in a large bowl of ice water for at least 5 minutes, then drain. In a saute pan over medium heat with a little olive oil sauté onion, garlic, peppers and Cajun seasoning until soft, 5 to 6 minutes. Mix in beans and andouille. Cook until mixture is heated through, 6 to 8 minutes more. Divide mixture among plates and serve over rice. In a pot, over medium high heat toss rice in a little olive oil until well coated and slightly toasted. Add chicken stock and bring to a boil. Cover and remove from heat. After 20 minutes, remove cover and fluff rice with a fork. College is back in full swing. Class schedules are becoming routine, papers are being drafted and beer is being guzzled by the gallon. Every so often I like to take simple items from the store and make something special and quick. 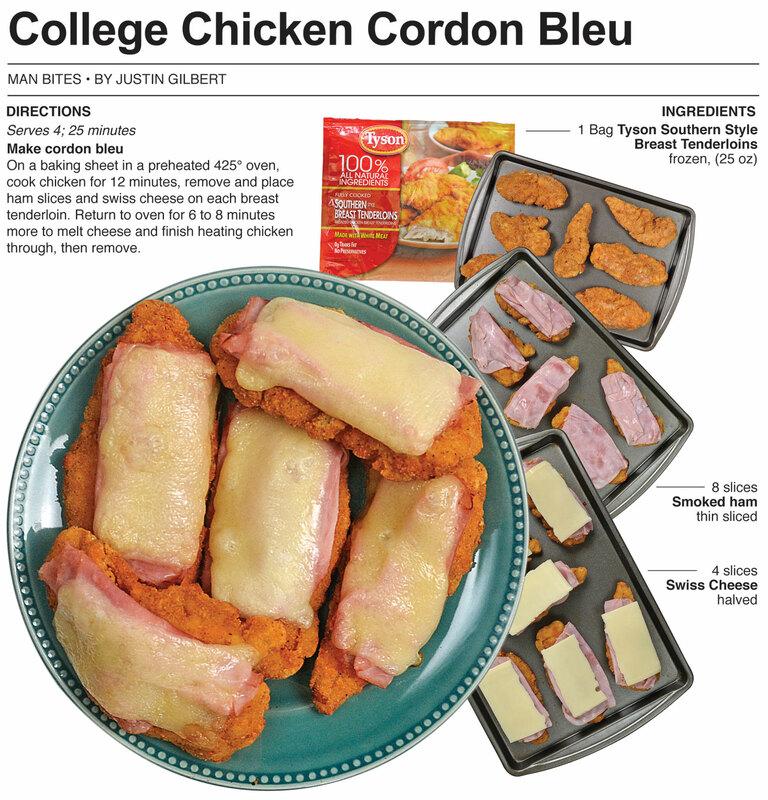 This recipe, easy crispy chicken cordon bleu, is as quick and simple as it gets. It takes twenty five minutes and requires no cooking skill except for the ability to operate a conventional or toaster oven. It’s the perfect snack for a busy college student who wants a little more than ramen noodles and has only a short time to eat between classes. Any breaded chicken breast works here, but in this case I use Tyson’s Southern Style Breast Tenderloins that are fully breaded and cooked and can be found in the freezer isle of just about any grocery store. I was impressed by the chicken, it had great breading that packed a mild spicy kick. I worked a reception recently with Big John Maxwell (aka The Ragin’ Cajun) and one of the items being prepared was chicken cordon bleu for 250 people. 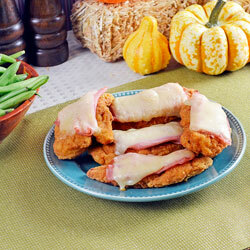 To save time the chicken tenderloins were left whole and were breaded, the ham and cheese topped the chicken instead of being stuffed inside. It was a smart and efficient way to make a serving of a difficult dish to create for that many people. I also thought it was a great way to make a lunch or even sandwich when time is an issue with frozen breaded chicken. It has all the traditional flavors, it is just doing it quick. 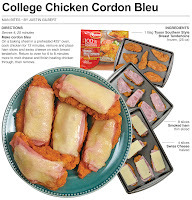 A real chicken cordon blue is hard to make and actually requires some technique. This recipe is the easy college version inspired by the catered version. 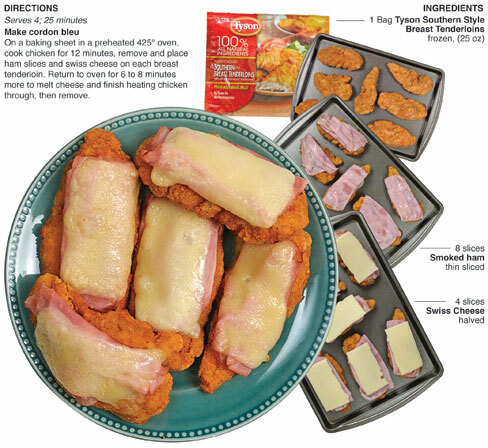 On a baking sheet in a preheated 425° oven, cook chicken for 12 minutes, remove and place ham slices and swiss cheese on each breast tenderloin. Return to oven for 6 to 8 minutes more to melt cheese and finish heating chicken through, then remove and serve. Chili makes me think of Texas but there is a version that was made famous in Cincinnati. Typically it is served over spaghetti with beans, cheddar cheese and diced onion and could almost be thought of as a sauce rather than chili. It was developed by Athanas “Tom” Kiradjieff, a Macedonian immigrant, and his brother John in the 1920s at their small Cincinnati restaurant which became known as Empress Chili, a name inspired be the business next door – the Empress burlesque house. 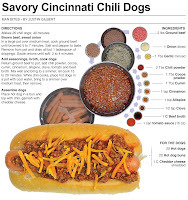 Unlike Texas chili that contains heat from peppers, Cincinnati chili features spices such as allspice, cinnamon and cocoa and is sweeter in taste. Now that football is back and fall is just around the corner, I felt it was time to come up with a new chili. 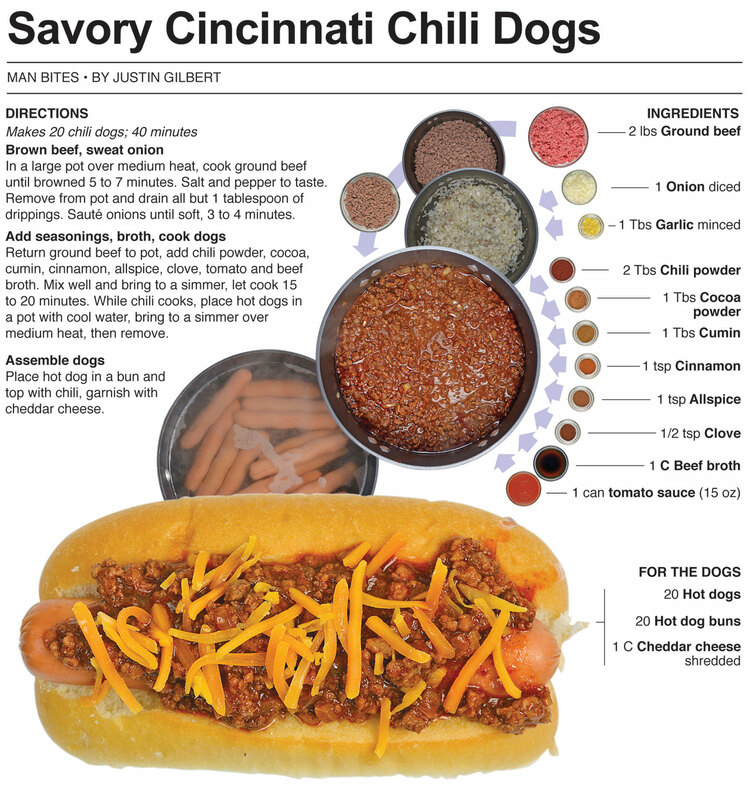 For this recipe, I make one inspired by the Cincinnati version and serve it on a hot dog. It’s the perfect dish to make for a tailgate party before a game or a gathering of friends around a campfire. I made it for lunch because I love chili dogs! Memorial Day weekend this year I was out camping, but on Sunday I left for a while to watch the beginning of the Indianapolis 500 with my Dad, the race is his Super Bowl Sunday. He had made chili for some dogs as a snack for the race. Like me, he gets cravings for chili dogs every so often and the 500 was the perfect excuse. The chili had great flavor and after I complimented him, he showed me a spice packet used to flavor it. He had followed the recipe on the back to the tee. It was Cincinnati chili. I was hooked. I knew as soon as fall weather rolled around I would be making a batch from scratch for the column. The spices really make it stand out, the cinnamon and cocoa just make me want to grab a bucket and drink it down like a glutton on a beer binge. It is good by itself but I believe it’s best on a hot dog. The flavors mix well together and it really does resemble a meaty sauce like a bolognese, which is why I think it works best on other things like dogs or a plate of spaghetti. 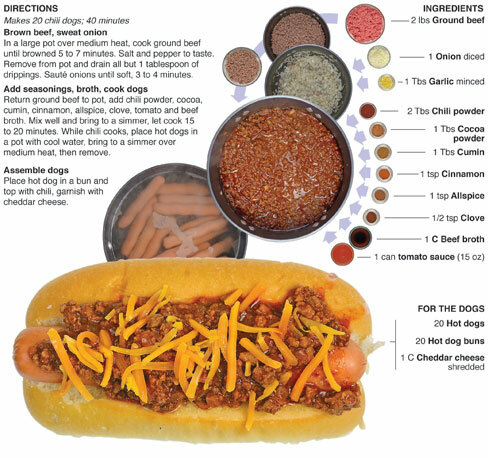 However it is eaten, it’s a great chili to try - especially if your a chili dog fan. Brown beef, sweat onion In a large pot over medium heat, cook ground beef until browned 5 to 7 minutes. Salt and pepper to taste. Remove from pot and drain all but 1 tablespoon of drippings. Sauté onions until soft, 3 to 4 minutes. Add seasonings, broth, cook dogs Return ground beef to pot, add chili powder, cocoa, cumin, cinnamon, allspice, clove, tomato and beef broth. Mix well and bring to a simmer, let cook 15 to 20 minutes. 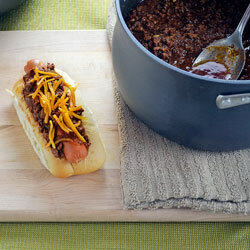 While chili cooks, place hot dogs in a pot with cool water, bring to a simmer over medium heat, then remove. 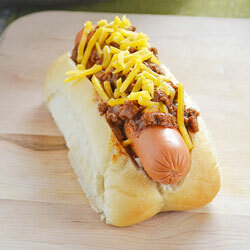 Assemble dogs Place hot dog in a bun and top with chili, garnish with cheddar cheese.